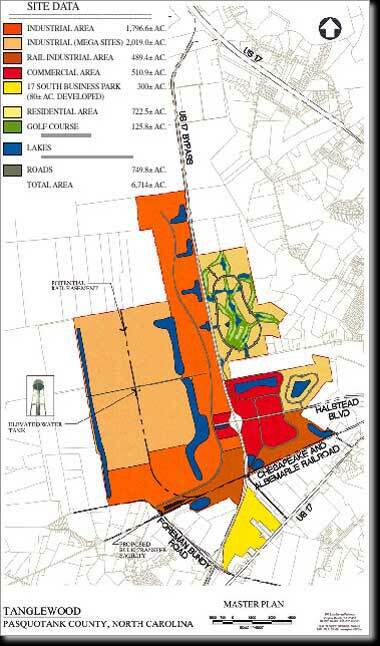 Langley & McDonald prepared a Master Plan for the 6,700 acre development of Tanglewood Farms. Tanglewood Farms is strategically located on US 17 Bypass around Elizabeth City, NC, and therefore it has become prime real estate for retailers, manufacturers, service industries, distributors, and technology industries. 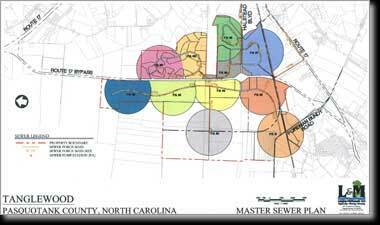 The Master Plan included analysis and planning for all major infrastructure: roadways, rail, water, sewer, and stormwater management. With a direct connection to downtown Elizabeth City via a new interchange with Halstead Boulevard, Tanglewood will soon become a new economic center for living, working and recreating.